This episode is based on the Gorman Dogfight. Two fighter pilots are their way back in. One of the pilots does a fly-by over a football stadium when things go wacky and a UFO flies past him. A bright orb. The pilot starts chasing it but it's to fast. He stalls and goes into a tail spin. A bunch of guys are watching The Day the Earth Stood Still. They're talking about the UFO situation and the Hollywood obsession. General Harding wants the team to deal with the Fargo situation. He arrives at Wright Patterson Air Force Base and goes into a room where he sees a bunch of UFO articles pinned on Captain Quinn's wall. 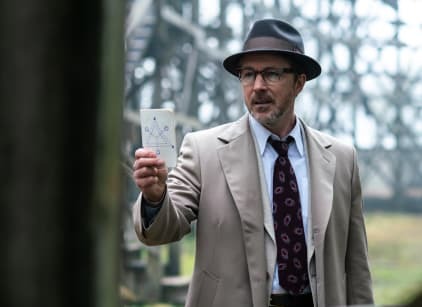 Harding wants Quinn to partner up with Dr. J. Allen Hynek to find logical explanations for the UFO sightings. Hynek meets with Quinn and Quinn pitches the job to him. Hynek declines. Quinn tries to convince him again. Hynek agrees with conditions. He talks it over with his wife. He tells his son that what he's going to do is going to be a little like Flash Gordon fighting evil spacemen. Someone is watching him get into a waiting ride to the airport. It's the man in the hat who follows them. Hynek and Quinn start investigating their first case: the Fuller dogfight. They go to the airbase where Fuller's plane is being held. Fuller is there. They talk to him to find out more information. While Quinn talks to Fuller, Hynek checks out the plane. Hynek's wife visits a department store where she meets Susie. Hynek and Quinn leave the base and discuss the case. Hynek plays devil's advocate and introduces his new terminology - UFO. Quinn believes what Fuller saw was a weather balloon and takes Hynek to a base where there's one available to view. Hynek isn't convinced. Mimi and Susie are becoming quick friends in the department store. Hynek and Quinn are having lunch at a local diner in Fargo. Hynek isn't convinced it's a weather balloon after his calculations. Quinn is going to take Hynek up in a plane to prove his theory. Mimi is trying on new dresses and getting Susie's opinion on them. Quinn and Hynek are in the air. They recreate Fuller's flight. During the exercise, Quinn hits the weather balloon and they crash. Hynek sees the man in the black hat as he surveys the damage to the plane. He's also dizzy from the crash. Harding visits Quinn and Hynek at the military hospital. Hynek visits with Fuller who is still listening to the song he said the aliens drilled in his head. Hynek tells him what he and Quinn did. Fuller says he wasn't in control of the plane and that's why he fly the plane the way he did. He says that the alien used the song to communicate with him. Harding shows up and eavesdrops. He's not thrilled with the idea of flying saucers because he believes they don't exist. Quinn and Hynek leave and Hynek heads back to Ohio. Hynek drives to the airport and is followed by another car who crashes into him. It's the black hat man. Hynek finds the car went into an old abandoned amusement park and takes chase. He follows the guy into a building. He finds a room with a bunch of strange things and a film playing. It's a wird symbol and montage. Hynek gets home and Mimi tells him about Susie. He calls Quinn about the information he found about the song. He's convinced there's something else going on. He has the strange symbol in his notebook but then he decides not to share what he thinks with Quinn. When he goes outside with his wife Susie is taking photographs. Fuller is being visited by the men in white. They shoot him up with something and take him away. Harding gets a call that the deed is done.